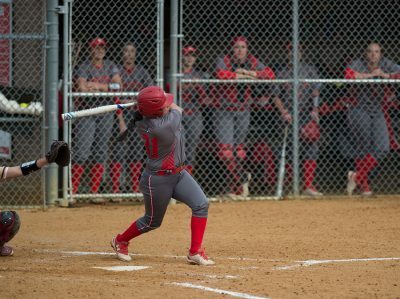 The Boston University softball team swept Lehigh University in a doubleheader Sunday afternoon, becoming only the fourth Patriot League team to beat the Mountain Hawks (11-19, 6-3 Patriot League) in a doubleheader in 25 years. With 5-0 and 3-1 wins, the Terriers (20-17, 4-2 Patriot League) avenged a loss in game one on Saturday where they fell to Lehigh 8-5. The Mountain Hawks led 2-0 after the first inning, and that would hold until the Terriers came up to bat in the bottom of the fourth. Senior infielder Brittany Younan came up with a clutch two-out, three RBI double to give the Terriers a 3-2 lead. However, Lehigh would get the lead back in the next inning, courtesy of a two RBI single from junior outfielder Ashley Rabago. Sophomore infielder Mary-Hannah Smith then added to the lead with one of her three hits and RBIs of the day. BU freshman pitcher Ali Dubois struggled through 4.1 innings and gave up five runs, the most she has allowed in a BU jersey. The Mountain Hawks and Terriers scored in both of the final two innings, but Lehigh held on for an 8-5 win. Dubois would redeem herself the following day, scattering four baserunners, three hits and a walk over a complete game shutout. BU would take a lead it would never relinquish in the bottom of the first, thanks to a bases-loaded walk from senior infielder Kaitlin Sahlinger. Sahlinger would drive in another run to complete a three-run third inning for the Terriers with a double. Junior catcher Alex Heinen capped the contest with a single to third for the 5-0 win. BU’s strong pitching would continue in the second game of the doubleheader, and it was another freshman, Cali Dolfi, who would pitch well. Over three innings, Dolfi would give up six hits, but got outs with runners on and Lehigh only scored one run off the Galveston, Texas native. Dolfi’s classmate Dubois would come in after a leadoff single in the fourth and shut down the Mountain Hawks for the next four innings. Lehigh only had three baserunners the rest of the game against Dubois, and did not get a runner into a scoring position in the last three innings. Waters also noted Heinen’s contribution in limiting the Mountain Hawks’ chances to score. The Mountain Hawks took the lead in the top of the third off a solo home run from sophomore catcher Emily Preble. The Terriers would respond in the bottom half of the inning by taking the lead 2-1 after Heinen drove in two runs with a single up the middle. Junior catcher and infielder Alexa Ponce drove home the third run of the game with a single in the sixth inning for BU’s 3-1 win. BU is now in second place in league standings behind Bucknell University and has become the first Patriot League team to secure 20 wins this season. The occasion’s HP is restored over time.